I'm living in La Crosse, WI right on the Black River about a mile up from the Mississippi River. Each spring, as the ice melts, we get a large migration of bald eagles. Still selling insurance in Hamilton, Ohio just down the road from Mother Miami. My wife Charmaine and I have one son Sean, who is studying engineering at Purdue. Charmaine is retired from Procter & Gamble and now operates a consulting business out of our home. We have a second home on a lake in Paw Paw, Michigan just outside of Kalamazoo. If you are in the Oxford area, would love to hear from you. Barb and I are celebrating a year of retirement from Pfizer after a 32 year career in field sales. We are enjoying the frequent company of our 2 married daughters and 3 grandsons, all in the Cincinnati area...so we won't be relocating to the Villages. Some golf and a lot of "doing whatever the h--- I want" fill up time after assigned tasks. Still married to Debbie Day, 3 kids all out of the house, Barry is in the US Navy Sea Bees serving in Iraq, Jenny graduated from Ohio U, is married living in Christiansburg, VA and is teaching and youngest son Rob is senior at Ohio State & played 4 years for the OSU Men's Soccer team. Still own an insurance agency in Twinsburg Ohio. When I can I still make it to Canda with the early/mid 70's Delts for the annual Canada Fry fishing trip. Have been living in Lakeland, Florida since 1980. I am a CPA and work in Tampa as Pres/CEO for Grow Financial Federal Credit Union. Married to my wife Nancy for 28 years. She is a Clemson graduate and has been an international flight attendant for Delta for 30 years. Currently have a son and daughter in college, both at the University of South Florida. 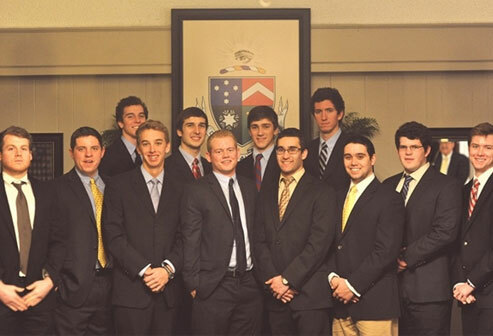 My son is a Sigma Chi (ouch!). There are not many Delt chapters in the South. My spare time is spent as a soccer referee for both club and high school, or riding my motorcycle. Ultimate goal for now is to get the kids out of college and off the payroll. Plan on retiring to Clemson some day where we have a future retirement home. Only brothers I've really kept up with are Jim Gieringer and Bob Kemp. Call me at 800-839-6328, ext. 2000. I've been living in Colorado Springs, Colorado since 1980 and haven't really connected with too many of the old Delts prior to last year's flurry of emails that were precipitated by Meaner ... thanks for getting all of us connected again big guy. I'm married to Ann (this is a different Ann than the one you guys knew) and have two Kids. Drew is 20 and is in his second year at Fort Lewis College in Durango, Colorado and my daughter Emily is a junior at Air Academy High School here in Colorado Springs. I'm still working at GMDC, a national trade association that I joined in 1980 and in 2000 I was named president/ceo. My wife actually works here as well. I travel quite a bit in my role (about 150-160 days per year) so it would be great to connect with some of you guys if my travels bring me your way. Life is good with the exception of an injury I sustained down at the St. Louis Cardinals Legends Baseball Camp back on January 25. While making a throw from the outfield my right arm suffered a spiral fracture (think Dave Dravecky or Tom Browning of the Reds) and I'm now the proud owner of a 9mm X 260 mm titanium rod that runs from my elbow to my shoulder. This getting old is not so much fun guys. If any of you are ever out here in Colorado I've always got a cold beer and a bedroom if you'd like to stop by our home. Also, if any of you are up in Minnesota we're up there quite a bit between June and August at our lake house outside St. Cloud ... we'd love to see some visitors and take you for a ride on the party barge!! Still working and playing music. Moved to a house in the country with my wife, Janet, and was soon followed by her Daughter w/husband, and 2 grandchildren. They will be out by summer, so we can resume our honeymoon. Good to hear from Roger Grigg. Couldn't find Prohaska's note on the site. How's it going Jon. After graduation I did my time in the army and then finished my Masters at Xavier in Cincinnati. I married Karen Matesky and we moved to Lima, Ohio where I began a 26 year career with Monsanto Company in Human Resources. Second stop on the career path was New Jersey and then we moved to Idaho with Monsanto in 1979. We lived in the mountains in Soda Springs, a town of 3500 people. There we raised our two boys and soon adapted to a life of outdoor activities including skiing, hunting, fishing, camping & raising and riding horses. I retired with an early out package in 1999. Karen passed away a year after that and I continued to live in Soda Springs for the next 5 years. I moved to North Idaho (Coeur d' Alene) in 2005 and I had a house built south of town in the mountains on ten acres. I still do some consulting but mostly I fly fish and enjoy the great outdoors. My wife, Cyndi, and I have been married for 7 years. We have two children, our son Haydn (4 1/2) and our daughter Sterling (6 months). I recently completed a 24 year career with a large IT firm, with the last three years working as on of the general partners in the venture capital group. My wife is an interior designer. My wife and I are avid windsurfers and horse back riders (jumping), and are also passionate about biking (rode and mountain), skiing and running. Still grinding it out as a broker at the Chicago Board of Trade. Alex(14) and Claire(10) are still on the payroll. Currently associated with Equity Office Properties Trust (EOP), a real estate investment trust. EOP is the largest commercial landlord in the US. My responsibilities rest primarily in the development and energy facets of the company. My family is pretty Miami oriented. Nancy, my wife, is a graduate. My brother, Jim, followed in my footsteps 6 years later and also became a Delt. My daughter currently attends Miami as a junior in earth sciences education. My son is a sophmore at Downers Grove South High School. Hopefully he also will attend. I recently spoke with a fellow currently with Sempra Energy in California who also was a Delt and graduated during the latter '80's. I would welcome any emails from those that attended Miami during the years 1971-75. They were fun years where a great deal of kitchen work was accomplished by a few with the tutelege of Helen, our master chef.